Thanks for stopping by. I have another post for you, but first I want to give a shout out to Amy at Love to Crop. We chatted through email. It was fun. Have fun at your scrap booking party. Yes indeed another pocket card. Remember what I said I love pocket cards, making them, and finding new ways of make them. With this pocket I made it a few weeks ago when we worked with the Pagoda cartridge for the MAG challenge, but I could not use it because I used another cartridge. Here it is. This is awesome. I love the panda! I love the panda, too! I don't have Pagoda, but I think I might have to invest... As always, your card is just beautiful! Wow, Gloria! As a friend of mine would say, U SMOKED this!!!!!! Wow this is pretty- I love this cartridge thanks for coming over to my blog. maybe my pagoda design got you thinking about using that cartridge. I always enjoy your positive comments. I might try another challenge I have only been in one and one hop. It is so exciting seeing the creativity. I've never done a pocket card. Cute,cute,cute!!! 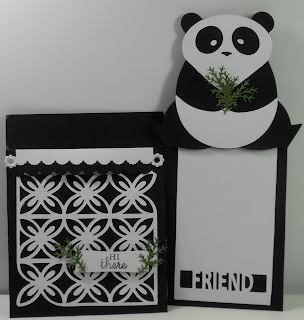 I just love that panda cut and plan on using it for a layout of a trip to the San Diego zoo. Love how you've used it to put in a pocket card. Thanks for sharing it with us at Paper Cutz. You are so very talented!! 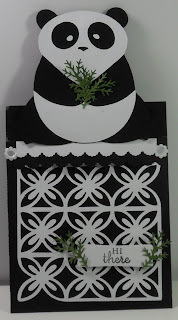 Love this card and would love to try a pocket card...I put in on my list of must try's. Thanks for sharing!! Very cute! I really like these pocket cards! Wow I love your card. Panda's are so cute. Do you have a description on how to make them? Have I told you that Pagoda is one of my favorite carts?! LOL!! Anyway, I love this Panda pocket card that you made. Love what you are doing with the Pagoda cart! I think the Far East DCWV stack is a nice accent for this cart as well! Very Cute panda card.LOVE it sooo much! 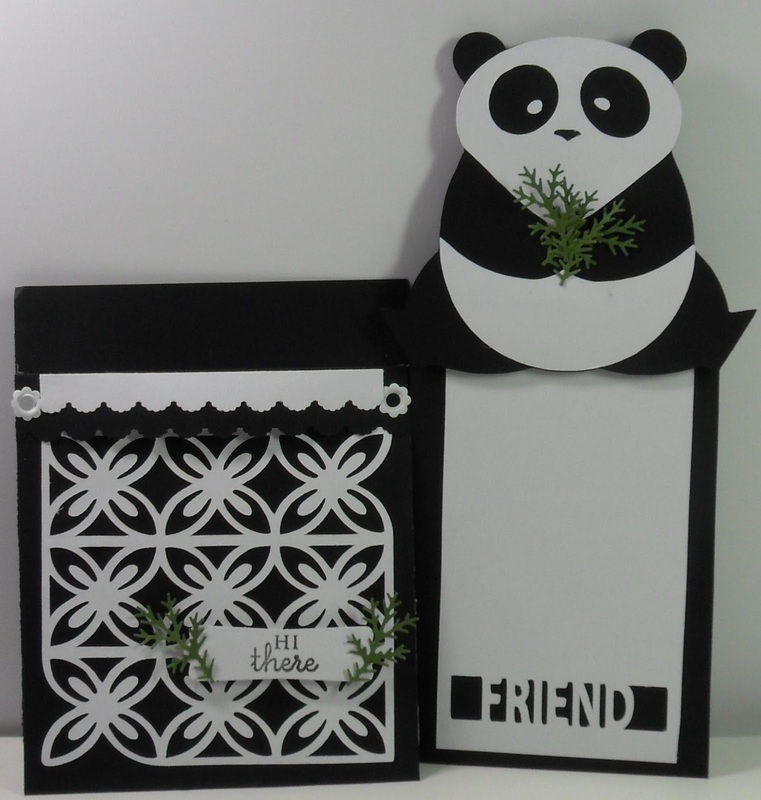 I really am loving your pocket cards, that panda is so cute! I have to learn how to make pocket cards! Love it, TFS!! This is beautiful! 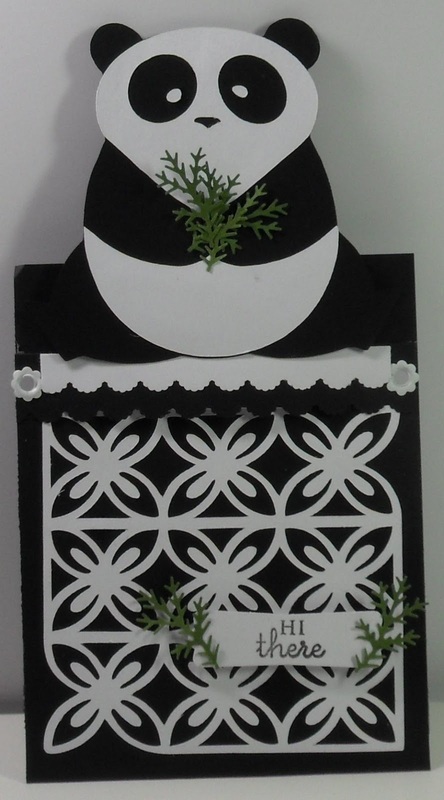 I love the black and white and the latice cut! SO CUTE! I love this card!! You always come up with the greatest cards!! Thanks so much for sharing. This is so super cute! I love the panda!!!! You did a great job! TFS...I am going o try making a pocket card. Nice card! Who wouldn't love finding this in their mailbox!!?? Oh, how I wish I had a cartridge with a panda...I guess I'll have to try to create one myself...wish me luck!! :-) I think this is the first time I've seen one of these pocket cards...very cool! TFS!